Tracing the history of Wing Chun is no easy task, as much of the early history was passed on orally ‘from teacher to student rather than actual documentation. There are various stories told through different lineages of the history of Wing Chun’s development. After much research, the following is the author’s opinion of a more accurate history of Wing Chun. 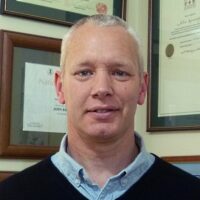 I apologise for any errors beyond my control, please feel free to contact me. From 1644 to 1911, the Manchurians ruled China in a period known as the Qing dynasty. Early in the 1700s, the Manchurians became concerned about the Siu Lam Temples rebellious activities and their continued development of the fighting arts. Under the decision to eliminate the threat of these rebels and their leaders, the Manchurians attempted to exterminate the Siu Lam monks to prevent them from spreading their martial arts skills and knowledge. Eventually the Siu Lam Temple was burned and destroyed. According to Wing Chun’s oral tradition, prior to the destruction of the temple a comprehensive Martial Arts system was formulated through generations of Siu Lum knowledge and experience. In Siu Lum a special hall was built in which only the most experienced monks met over the centuries to improve and refine their kung fu. The hall was named Wing Chun Tong (Forever Springtime Hall). The martial arts and Nim Lik (mind force) development taught in this hall become known as Wing Chun kuen (Always Spring Hall Boxing). Two Siu Lum monks managed to escape the Manchurian massacre and were able to keep the Wing Chun system alive. One of these monks was the twenty-second generation Siu Lum grandmaster, Yat Chum Dai Si, the other monk was named Cheung Ng. Before his death, grandmaster Yat Chum Dai Si passed on his high level of Wing Chun knowledge to Cheung Ng. In order to keep his identity and Siu Lum background hidden from the Manchurian government, Cheung Ng joined the Red Boat Opera Troupe. The name was given to this organisation of talented stage performers who traveled in the red boats. Accomplished in kung fu and gymnastics, they formed their own association called the Hung Fa Wui Goon (Red Flower Union). Utilizing heavy make-up, elaborate costumes and stage names, the Red Boat opera Troupe was Cheung Ng’s safest refuge. 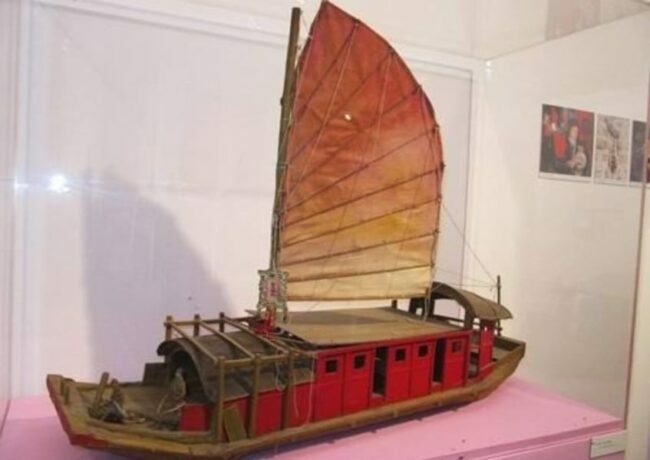 One of the Red Boat Opera Troupe actors by the name of Hung Gun Biu (Red Bandanna Biu), was a secret society leader and brought Cheung Ng into the organisation. The safety of the opera troupe combined with the security of the secret society is what allowed Cheung Ng to spread his Wing Chun knowledge in confidence. 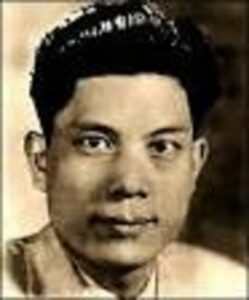 Cheung Ng became known as Tan Sao Ng (Spread-Out Arm Ng) from his skillful use of the Wing Chun maneuver Tan Sao to subdue others during challenges. In order to protect the system’s origin and the identities of Yut Chum Dai Si and Tan Sao Ng, a story was created. It was said that a Siu Lam nun named Ng Mui taught the martial arts to a young women named Yim Wing Chun. As Yim Wing Chun taught it to others, the system became known as Wing Chun kung fu. 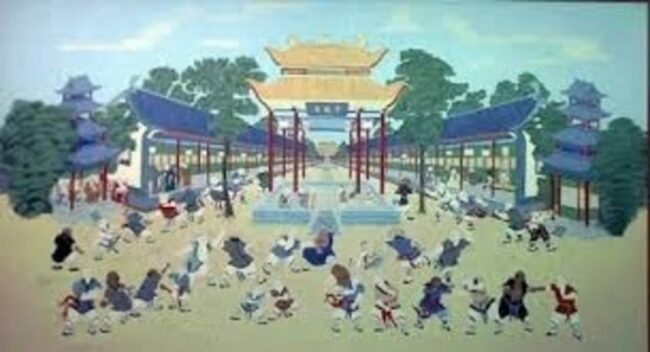 Among the first generation disciples to learn Wing Chun outside the Siu Lam Temple included Hung Gun Biu, Wong Wah-Bo, Leung Yee-Tai, Dai Fa Min Kam (Painted Face Kam), Lo Man-Gong, Siu-Sang Hung Fook, and Gao Lo Chung (Tall Man Chung). Based on their individual understanding and degree of training in Wing Chun, these disciples all previously trained in other martial art styles, hence there are various different lineages of Wing Chun that have been passed on from these first generation disciples. 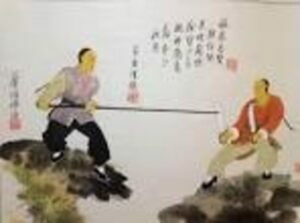 Leung Yee-Tai was a strong boatman who steered river boats by pushing a long pole against the river bottom. A Shaolin monk Jee Shim, who was a cook on the Red Boats saw that he was a natural successor to the Shaolin pole fighting skill called six and a half point long pole. 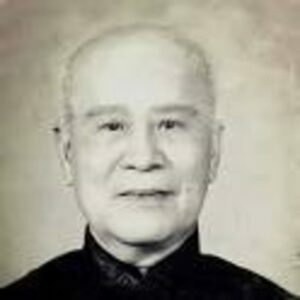 Wong Wah-Bo who had mastered the empty hand techniques of Wing Chun admired Leung Yee-Tai’s skill with the long pole and offered to teach him in exchange for learning the long pole. The two exchanged ideas and trained together regularly. While docked in Foshan due to a ban on opera performers, Leung Yee-Tai fell ill, he visited a local medical pharmacy seeking treatment. There he met Dr Leung Jan, who helped Leung Yee-Tai for free. Leung Jan was born between 1816-1826, his father was a herbal doctor who ran a pharmacy on Fai Jee Street. Leung Jan was the youngest of two sons, the eldest son Leung Dak Nam became a business man, while Leung Jan followed in his fathers footsteps with his love of medical knowledge. Leung Jan took over the family pharamcy known as Wing Sang Tong after his father passed away. Due to Leung Jan’s good nature of helping the sick and poor for free, he was accepted as a student of Leung Yee-Tai’s. 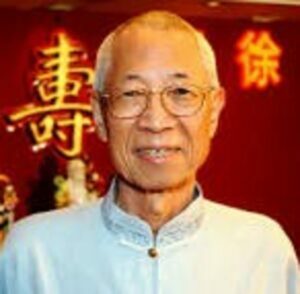 Later Leung Yee-Tai introduced Leung Jan to Wong Wah-Bo, to further his studies of Wing Chun. Wong Wah-Bo later left to rejoin the Opera performers, while Leung Yee-Tai stayed in Foshan and continued training with Leung Jan.
Leung Jan was given the title ‘’Wing Chun Kuen Wong’’ or The fighting King of Wing Chun Fist. This was earned over the course of 300 challenges, in which he was undefeated. He was also the first to defeat a wide range of styles using the Wing Chun Fist methods. Leung Jan had only a handful of disciples, including his son Leung Bik and Chan Wah Shun. Leung Bik was said to have been the eldest son of Leung Jan, according to variuos sources his second son Leung Chun was infirm and died at a young age. Leung Bik was said to have achieved the higher more internal aspects of Wing Chun. He later moved to Hong Kong and would eventually cross paths with a young Ip Man. Chan Wah Shun (1833 – 1913) originally worked as a moneychanger (someone licensed to convert currency denominations) and was hence known as Jiao Chin Wah (Moneychanger Wah). His stall was located in the marketplace close to Leung Jan’s pharmacy on Fei Jee Street. Chan was a very robust person; due to his profession, he had to carry very heavy loads of coins everyday around town, and thus built up very strong muscles over the years. 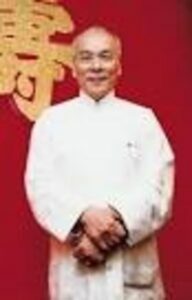 He had also studied other martial arts before learning Wing Chun under Leung Jan.
At the age of 25 Chan Wah Shun was able to secure training under Leung Jan and went on to become one of his most prized students, winning many challenge matches, and earning the name Ngau Ching Wah (Bull Wah). Because of his profession as a moneychanger, he also had many opportunities to use his Wing Chun skills to defend his business. At the age of 35 Chan Wah Shun gave up the money changing business to work as an osteopath, a trade which he learned from Leung Jan. The first two students Chan Wah Shun accepted were the brothers named Ng Siu Lo and Ng Chun So. It wasn’t for a period of time that he finally mentioned to Leung Jan that he would like to teach more students on top of running his osteopathic clinic. The Third student was named Lui Yu Chai. 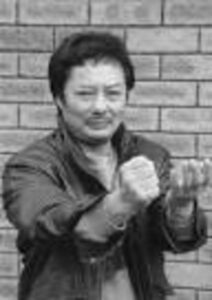 Lui was a master of Ng Lui Kuen or 5 Thunder fists. By the 1910s, according to Oral and Written Accounts Chan Wah Shun was teaching out of the Ancestral Temple of the Yip family in Foshan’s Song Yuan (Mulberry Gardens). Yip Man was the last student Chan Wah Shun accepted at age 70. Chan Wah Shuns teaching career lasted almost 36 years. 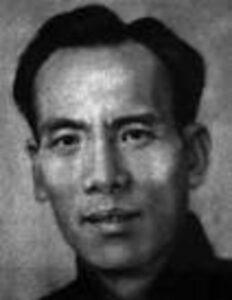 Some Oral Accounts suggest that Chan Wan Shun had a Stroke within 7 or 8 months of accepting Yip Man as his last Student. At that Time Chan Wah Shun asked Ng Chun So to continue Yip Mans training. Yip Man was born in the mid 1890s to a wealthy and influential family who were the owners of a farm and two rows of large old-fashioned houses along the whole length of an avenue in the town of Futshan, Guangdong province. In the centre of this estate was the ancestral temple of the Yip clansmen. It was there that the master Chan Wah Shun was teaching Wing Chun Kuen to a few select students. Yip Man regularly watched Chan Wah Shun teach his students, Yip Man became very interested in learning Wing Chun, so he approached Chan Wah Shun to be accepted as a disciple. Chan Wah Shun first thoughts of Yip Man was that he was to scholarly and gentle for the martial arts, so he asked Yip Man for a substantial tuition fee hoping to dissuade him. Yip Man desire to learn was so great however that he immediately returned with his life’s savings intent on pursuing lessons. Yip Man’s dedication won over Chan Wah Shun and he accepted Yip Man as his last disciple. Yip Man learnt from Chan Wah Shun for approximately 7 – 8 months before Chan Wah Shun suffered a stroke and passed away. 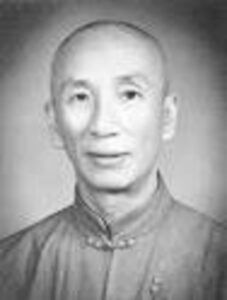 Yip Man continued his lessons under Ng Jung-So one of Chan Wah Shun’s most senior and talented disciples. During his teenage years Yip Man moved to Hong Kong to Study English at St Stephen’s collage, during his time there, he was involved in many scuffles between westerners at the collage, through this he gained the reputation of a skilled Wing Chun fighter. Leung Bik, Leung Jan’s son heard about Yip Mans skill as a fighter and so asked one of Yip Man’s classmates to invite him to visit Leung Bik so he could see for himself. Yip Man paid Leung Bik a visit, after a small discussion Leung Bik asked Yip Man to attack him. Yip Man not knowing who he was and seeing he was just an old man rushed in to attack the old man straight away. Leung Bik redirected the attack and sent Yip Man falling to the floor. Enraged by this Yip Man tried again, but with the same result, Yip Man asked who the old man was, after finding out that he was the son of Leung Jan, Yip Man pleaded to Leung Bik to teach him. Leung Bik accepted, and Yip Man spent the next few years learning the deeper more internal aspects of Wing Chun. Yip Man returned to Foshan after finishing his studies, there he continued training with his good friends and martial arts peers. During the Japanese occupation, conditions changed. Life grew more difficult and Yip Man saw his wealth and prosperity dwindle. Eventually the Communist party seized power over China after the defeat of the Nationalists; Yip Man lost his wealth and property and had no choice but to flee his homeland. In late 1949, fate brought Yip Man once again to Hong Kong. No longer young and wealthy, Yip Man took shelter at the Restaurant Workers Association in Kowloon thanks to the help of his good friend Lee Man. Teaching at the association at the time was a man named Leung Sheung. Although Leung Sheung taught Choy Lay Fut he had been exposed to a number of martial arts. Age had not dampened Yip Man’s feistiness; he critiqued Leung Sheung’s performance in front of his class. Yip Man’s slight build emboldened the larger Leung Sheung, he threw down a challenge to Yip Man, the result of which saw Leung Sheung asking to become Yip Man’s disciple, this was the starting point of Yip Man career as a professional Wing Chun teacher in Hong Kong. In the spring of 1950, Yip Man began with just over a dozen students. A short time later another class commenced with well over two dozen students. By 1951, a third class had begun with over forty people. Some of Yip Man’s early disciples included Leung Sheung (famous for his Biu Jee set), Chu Shong Tin ( famous for his Siu Nim Tao set), Lok Yiu (famous for his pole set), and Wong Shun- Leung (famous for his application of Wing Chun in challenge matches. Wing Chun proliferated among the restaurant workers and its reputation had spread, attracting people from outside the association as well. Wing Chun was finally taught publicly after decades of secrecy. In 1972, after having passed along his Wing Chun to thousands of students, and seeing the art spread around the globe, Yip Man passed away as a result of complications from throat cancer. One final biography should go to the authors Sigung (Grandmaster) Chu Shong Tin, as he was one of if not the only Wing Chun disciple of Yip Man that went deep into Wing Chun and discovered it’s internal roots. 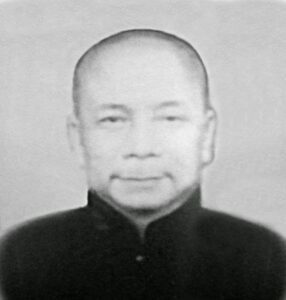 Chu Shong Tin born 1933, he was the third student of Yip Man in the discipline of Wing Chun, and remained at Yip Man’s school to become his senior instructor. Chu Shong Tin was nicknamed “The King Of Sil Nim Tao” for his deep understanding of the first form. Chu Shong Tin placed a great focus on this form in his teachings. He placed a great amount of emphasis on relaxation during the form, minimum to no use of muscular power. 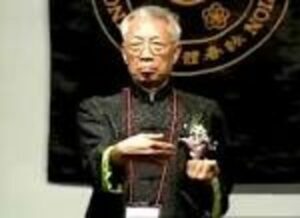 Chu Shong Tin taught an internal style of Wing Chun Kung Fu. 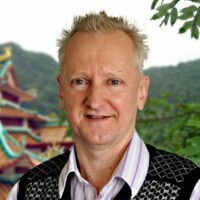 He moved to Hong Kong in November 1949, started learning Wing Chun informally in September 1950. The 17-year-old Chu was a secretary at a restaurant at whose premises Yip Man held classes, which he audited. Chu Shong Tin became Yip Man’s formal student in January 1951. As his health was not good, he took a concept-based form of the discipline. 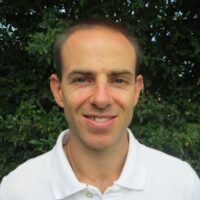 He taught selected students from all over the world, communicating with English speaking students through body language and hands on demonstration, or assisted by other Chinese students, since he did not speak English. Chu Shong Tin was a true master of Wing Chun Kung Fu. Students from around the world travelled to Hong Kong to feel the power of his Wing Chun system. Even the strongest of people could not resist Chu Shong Tin while he performed the movements of any of the forms, including the weapon forms. He was famous for overpowering people many times larger and physically more powerful than himself. Chu Shong Tin unfortunately passed away on the 28th July, 2014. 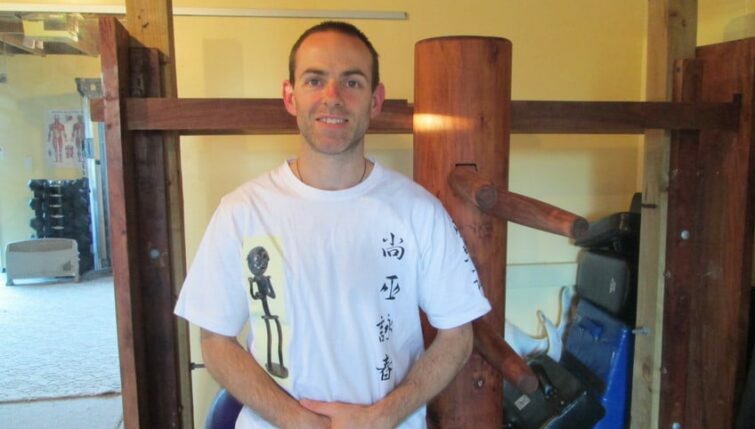 Leaving behind the legacy of Internal Wing Chun. The history of Wing chun is often debated from various lineages of the system. What is for certain is that Wing Chun has proliferated around the world and has became one of the most popular forms of Chinese Kung Fu.